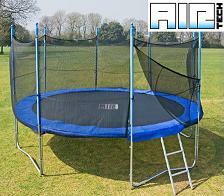 This article reviews the range of Airtech Trampolines. 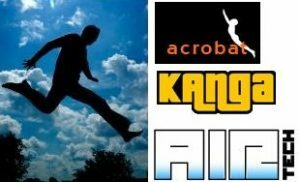 Which Different AirTech Trampolines Are Available? AirTech offer a wide range of trampolines with products and accessories suitable for all the family. Choosing your Air Tech trampoline is simple. Firstly, Air Tech supply trampolines in four sizes (8ft, 10ft, 12ft or 14ft), allowing you to tailor your choice to suit your garden space. Click here for the full range of AirTech trampolines. Each size is available in three grades (platinum, gold and silver) according to the flexibility or tautness of the jump mat, and the maximum weight which can be carried; this makes it easier to select the correct product for specific users. Whatever AirTech trampoline size you prefer, you have the silver, gold and platinum options to choose from, which means the product you buy is the one best suited to your requirements. Put simply, the tension applied to the jump mat varies according to the number of springs used in the trampoline’s construction. Fewer springs create less tension, making a trampoline easier to use for lighter or younger users but too soft for heavier jumpers, who may enjoy the greater ‘bounce’ created by more springs. Whether choosing an 8ft, 10ft, 12ft or 14ft trampoline from AirTech, you will still have a choice based on the number of springs. The silver and gold editions of each trampoline (8ft, 10ft, 12ft and 14ft respectively) feature lightweight steel frames which will support a total weight of 19 stone. For heavier use, supporting up to 24 stone, you can also purchase a platinum version with toughened 2mm frame. As might be expected, each silver version is built with the fewest springs, and is therefore better suited to junior users. Platinum versions have the most springs, making them a great choice for older users; and gold provide an all-purpose model suited to a broad range of jumpers. There are many great features which you can expect to find on all AirTech trampoline products. With galvanised steel frames, all feature a permeable and weatherproof mat held in place with responsive springs, and enviable safety features in the form of a netted safety enclosure and padded protectors for thee dges of the trampoline. When purchasing your AirTech trampoline from Trampoline Warehouse, you will also receive a free ladder, protective cover and spring adjusting tool; PLUS a fantastic water slide as their free gift to you, offering hours of fun. Buy your AirTech trampoline from Trampoline Warehouse and rest assured that you are purchasing a quality product at a price you can afford. Click here for the full range of AirTech trampolines.